Right tackles Germain Ifedi and Isaiah Battle both left the Seahawks-Raiders preseason game due to injury and illness Amara Darboh was not cleared to play. Two of Seattle’s right tackles left the Seahawks’ 30-19 preseason loss to Oakland on Thursday night with apparent injuries, most notably starter Germain Ifedi. Seahawks coach Pete Carroll said Ifedi “turned his ankle’’ but said he also didn’t know if it was serious. He said he didn’t think it was too bad and noted that Ifedi was walking around later. Backup offensive tackle Isaiah Battle battled illness all week and that it “caught up to him’’ during the game, Carroll said. Battle was taken out during the first series when he was called for two holds and also gave up a sack. The loss of the two led to center Joey Hunt playing the fourth quarter at right tackle. Hunt also played guard in the game and Carroll volunteered a shoutout to him during his opening statement given that Hunt had never played tackle in a game for the Seahawks — he’s been almost exclusively a center — and rarely in practice. Carroll said receiver Amara Darboh didn’t play because doctors just didn’t clear him. Darboh has been dealing with a clavicle issue. However, Carroll indicated Darboh would be ready for the season assuming he makes the team. Guard J.R. Sweezy also didn’t play after suiting up and taking part in pre-game warmups. That sounds like Sweezy has made the roster. The Seahawks’ trade of a 2019 sixth-round pick to the Packers for backup quarterback Brett Hundley became official on Thursday, with the team waiving linebacker Jason Hall to make room on the 90-man roster. Hundley flew in to Seattle Wednesday and passed his physical on Thursday. He was not in uniform for Thursday night’s game. But during his weekly pre-game radio appearance on ESPN 710 Seattle, Seahawks general manager John Schneider noted that Hundley could make a quick transition because he spent the last three years in Green Bay under head coach Mike McCarthy. 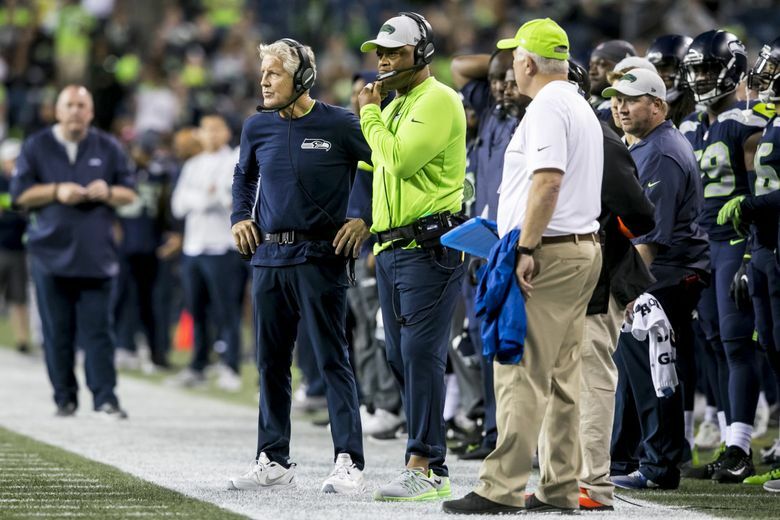 McCarthy and new Seahawks offensive coordinator Brian Schottenheimer worked together in Kansas City and Schottenheimer said in a recent interview with the Times that he considers McCarthy as having had as much of an influence on his coaching as anyone else. — Among those in full uniform during warmups were receiver Doug Baldwin and running back Rashaad Penny, each coming off of injury. Neither played in the game but their ability to go through a full warmup was another sign of that they will likely be ready for the regular season opener at Denver on Sept. 9. — Linebacker K.J. Wright was back on the sideline but not in uniform after having had arthroscopic surgery on his knee on Monday. — Rookie tackle Jamarco Jones was on the sidelines but with his foot in a boot and using a cart to get around after having had recent ankle surgery. He remains on the 90-man roster but could go on IR over the weekend. — Seattle’s came captains tonight were middle linebacker Bobby Wagner, quarterback Russell Wilson, Davis, defensive tackle Jarran Reed and kicker Sebastian Janikowski. — As they have each of the other preseason games, Duane Brown, Branden Jackson and Quinton Jefferson stayed in the locker room for the anthem. — Everett native T.J Oshie of the Washington Capitals raised the 12th man flag.